Wampler Pedals will launch on July 1st a new pedal that offers bass players overdrive and distortion effects. 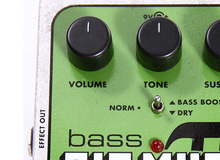 Pro Tone completes its effect catalog with the Bass Overdrive pedal modeled after Ampeg Fliptop amplifiers. Source Audio introduces AfterShock, a distortion pedal for bass included in the new One/Neuro series. Maxon introduces the BD10 Hybrid Bass Driver, a new overdrive pedal designed primarily for bass.